Four Honda drivers led 105 laps of the 110-lap contest Sunday on the 1.8-mile downtown St. Petersburg circuit, with Wickens dominating at the point for a race-high 69 laps. But a late-race restart on Lap 108 gave the second-running Alexander Rossi an opportunity to mount a challenge for the lead. The pair of Honda drivers made contact in Turn One, with Wickens spinning and making light contact with the outside wall. 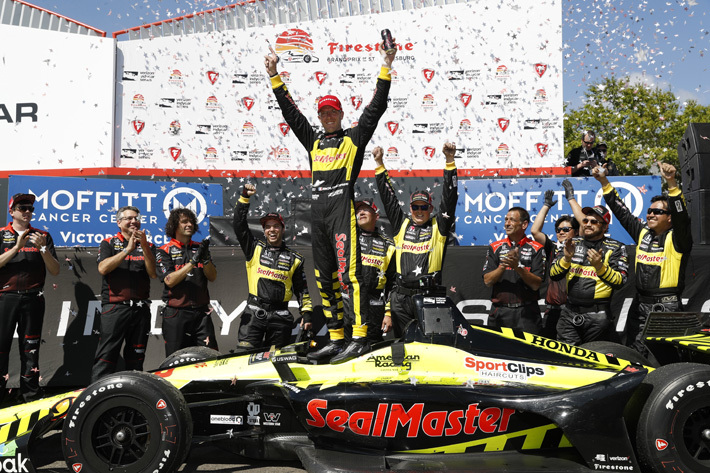 An opportunistic Bourdais used the opening to jump from third to first, and claimed the victory as the race ended under caution. A hard-charging Graham Rahal used all 110 laps to climb from last in the starting field – due to a spin in qualifying – to finish an excellent second; with Rossi recovering from his own slide following the contact with Wickens to complete the victory podium in third.